sheepless in suburbia: Happy February Cinnamon Hearts Retreat Weekend! Happy February Cinnamon Hearts Retreat Weekend! So - here I was thinking that I might be the only person having their own little "in house" long weekend quilt retreat. Boy was I wrong! I woke this morning to start Day 2 of the Stitch Cat Studio First Annual Midwinter Stitch Retreat but thought I'd do a quick check of my email first (quick as in get the coffee and put my feet up). the news headlines (just in case a meteor has hit and I need to hide my stash from end of world mad dog zombie crafters). my mail (just in case another long lost relative has left me their winning lotto ticket). my calendar (just in case I forgot the date and I'm actually supposed to be at work). Ravelry (I'm not knitting these days - but it's on the morning check list). and last (but not least) "Threadbias" - my newest online place to hang out and talk quilts. Yesterday I did pop by my LQS for my weekly FQ latte fix (since Fat Quarters are less expensive than lattes and don't affect my waistline I've headed down that route). I discovered I had a gift card from the store behind the counter! Yippee! This is like finding $20.00 in an old pair of jeans you haven't worn since... since... (hmmm there's a reason you don't wear those jeans anymore and made the switch to FQ lattes). Back to the retreat. There was a big retreat in progress at the store. It started Friday night and was going all weekend til Monday evening. I admit - I was jealous. I wanted to be there too. But you know how it goes. Besides I do have a Quiltalong day coming up next week... and I was having my own private retreat at home this weekend. But this morning the mail was loaded up with blog reports about "Virtual Stitching Retreats." being hosted by The Liberated Quilters group and the Dear Jane BOM group. Back to the actual -virtual Stitch Cat Studio First Annual Midwinter Stitch Retreat. 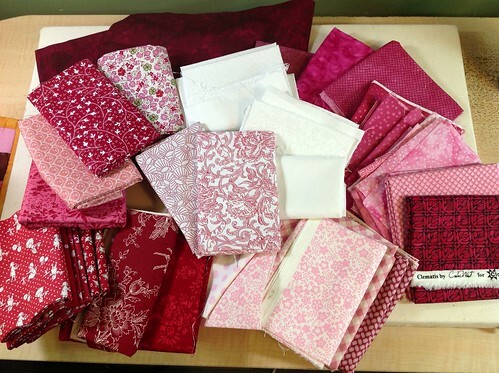 I have a lot of red and pink fabrics in my stash (top pic). I am wanting to learn a few QAYG (Quilt as you go) techniques and I am taking an online class via Craftsy which is teaching this QAYG specifically. 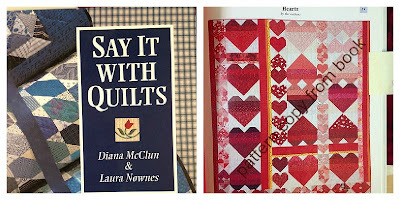 Since this is February and I love love love cinnamon hearts... hearts will be my quilt project for the retreat. 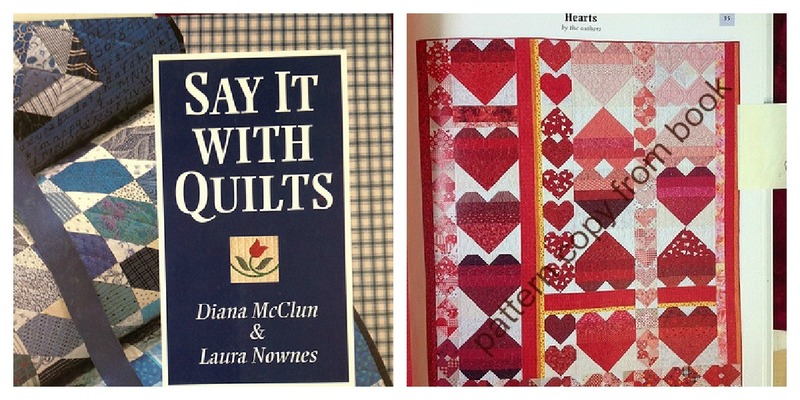 "Say it with Quilts" is a book I found at the used book store. The quilt is comprised primarily of half square triangles and double half squares triangles (which is just two half square triangles on the ends of a rectangle. There are 14 large hearts, 14 medium hearts and 62 small hearts. I have cut 768 rectangles and squares. My biggest worry is that 248 of the squares are only 1" x 1". Thus far I have completed 7 large hearts.